As you can see, there are pros and cons everywhere, no matter what your choice is. Now, this chart is based on a quick total collapse of society, such as the grid going down for good. 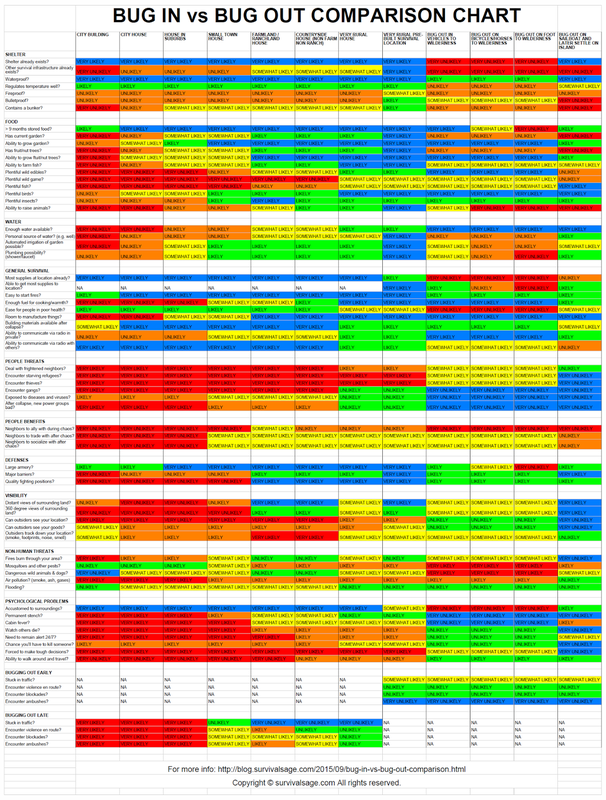 If you were to do this chart based on temporary emergencies or regional emergencies, there would be more blue in the stay at home columns. I encourage you to look over this chart and consider your own situation and scenario. Feel free to comment about any modifications you would make or any additions you would make to this chart. I tried to base it off average situations of American preppers and average residences. Your own situation may vary greatly. For further explanation, continue reading below. To get an idea of how the scenarios rank, we can do a simple count of the colored boxes in each column. Here's the results for that. From this simple tally, it looks as though the very rural pre-built survival location is the best option, with bugging out on a sailboat in a close second. However, you've probably realized that not all of these pros and cons are equal. Some are much more important than the others. For example, 9 months stored food and not encountering gangs is far more important than something like room to manufacture things. To fix this, we can just assign values to each of the rows based on importance. I did this in this next chart. Take a look and see what you think. So, according to this chart with the values, in a total collapse, bugging out on a sailboat and later settling on an island is the ideal choice. I agree with this. Bugging out on a sailboat really does eliminate a LOT of problems, since you'll be able to avoid nearly all of the chaos. Bugging out in vehicles to the wilderness comes in second according to this chart, which is ok, however I think that if multiple people are able to come together at the pre-built survival location, then that should be the next best option. This chart doesn't account for the potential security in numbers. The problem is that two of the top choices (sailboat and pre-built) will generally require at least a $50,000 investment. I suppose the good news is that the next best options, bugging out to the wilderness, won't require any investment beyond your general survival supplies. 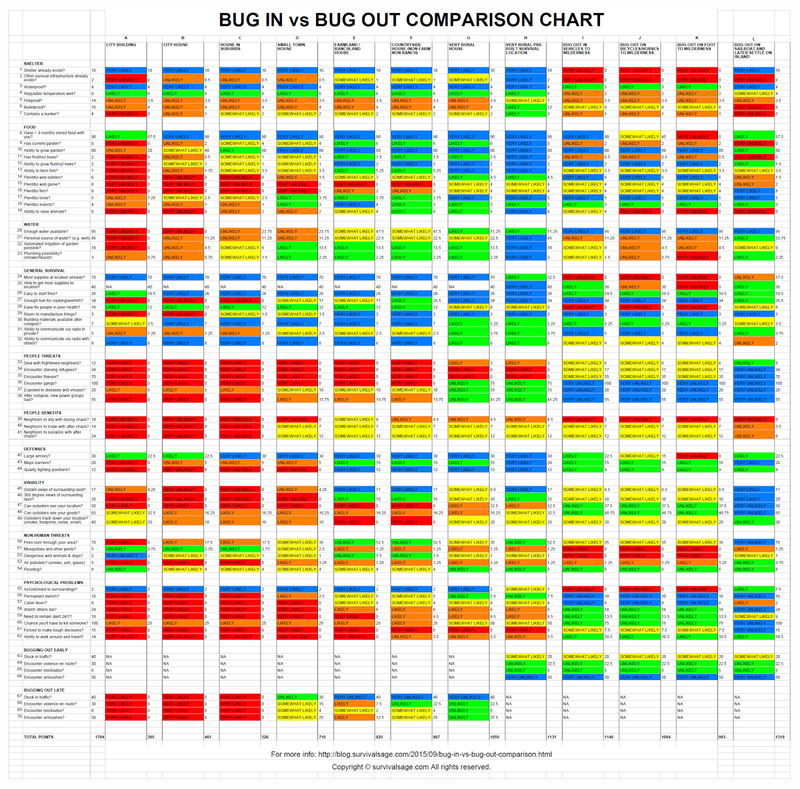 Feel free to examine this chart and value system to better assess your own survival situation to see if you should bug in or bug out. CITY BUILDING - An apartment building or condo building. CITY HOUSE - A house that is in the city and packed close to other houses and probably not a large yard and maybe no yard at all. SMALL TOWN HOUSE - In a town of a few thousand about 150 miles from a city. FARMLAND / RANCHLAND HOUSE - A house that is right next to crops, orchards, dairies, or a ranch with lots of cattle. You can generally expect small towns to be nearby and larger population centers an hour or more away. COUNTRYSIDE HOUSE - Just an isolated house in the country. Likely small towns a few miles away and larger population centers an hour or more away. VERY RURAL HOUSE - Far from population centers. Maybe a dirt road leading to it. Perhaps some scattered neighbors. VERY RURAL PRE-BUILT SURVIVAL LOCATION - This is a location that is built to be the ideal safe location in which to go if the shtf. It would be the right combination of keeping you safe and giving you the ability to grow food and thrive. Likely, this would be a location that is stocked, supplied and ready to go for the end of the world as we know it, but not occupied by you year round, so for the chart, I considered it a place to which one could bug out. It is also a good idea to be designed to house a few families. WILDERNESS - National Park, National Forest, State Park, BLM land, or very rural undeveloped land. You would camp in a location that is off road and off trail, so this goes far beyond just camping in a campground or along a main river. I mostly had the western US in mind with this. Bugging out to wilderness east of the mississippi would not have results as good as they are in this chart. BUG OUT ON BICYCLES/HORSES TO WILDERNESS - You are more mobile than on foot. You will hopefully be able to have wagons behind you or enough horses to pack plenty of survival supplies, but you probably won't be able to bring everything. The destination would be the same--off road and off trail. BUG OUT ON FOOT TO WILDERNESS - The traditional method here is to pack everything in a backpack and walk out. With this method, the biggest disadvantage is you wouldn't be able to bring with you 9 months supply of food and lots of survival gear, and this is the method I had in mind for the chart. However, if people were to load up their supplies in garden carts or wagons, 3 to 5 times as much supplies could be brought. It would make the column almost as good as the bicycles/horses column, but you would still be very slow and more vulnerable. BUG OUT ON SAILBOAT AND LATER SETTLE ON ISLAND - This could be a situation where you live somewhat close to the docks. 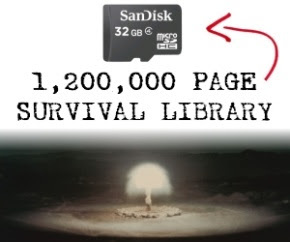 You have a good amount of survival supplies aboard already, but you have to load more. You would set sail within a day. A 40' catamaran or lager would be ideal. Communications and GPS would be out, so navigation is more dangerous, but being out at sea is safe from the human chaos. You could sail for an uninhabited island or even a sparsely populated island, where you believe the population will be able to survive. Of course, if it is a situation where only North America collapses, you can simply sail to a country that hasn't collapsed and start a new life. Indeed if only North America collapses, I would suggest anyone with access to a sailboat should try that method. "Other survival infrastructure" - things like smokehouses, outhouses, BBQ pits, wood stoves, fish ponds, etc. "> 9 months stored food" - this is a good benchmark, since it should give you enough food to get to the first harvest. "Personal source of water" - having your own source, such as a well or water harvesting system helps to ensure plenty of availability of water, but more importantly, can help you avoid run-ins with others who are fetching water or fishing. "Automated irrigation of garden" - something other than manually watering with buckets. Could be a system of pipes or hoses from a body of water or a tank/gravity feed system, just something to cut down on manual labor. "Plumbing possibility" - just the ability to set up showers and faucets, not necessarily flush toilets. It comes down to the ability to have drums/tanks/jugs with a satisfactorily sanitary runoff. "new power groups" - after the collapse, some groups, such as gangs, warlords, and militias will rise to power. If these groups are not civil and steal to survive, that will be a problem. "Major barriers" - these are barriers that would prevent attackers from over running you, such as barb wire, moats, walls, abatis, etc. "Can outsiders see your goods" - goods would be gardens, food, tools, supplies, living quarters, etc. A lot of this depends on how close your house is to the road and what kind of fence or wall you have. A high wall is best. A low see-through fence is the worst. Also, can people see through windows? "Fires burn through your area" - Fires will start from riots. Fires will also start from people cooking over open fire and warming themselves with fires. There will be mistakes and buildings and forests will catch on fire. There won't be any firefighters to put out fires. Fires will be a threat in the city, countryside, and forests--almost anywhere. So, this is asking if fires will burn through your area and kill you or destroy your livelihood. "Accustomed to surroundings" - for some people, being accustomed to your surroundings will be helpful in easing concerns, even though in reality, it is a false sense of security. "Permanent stench" - this will come from trash, sewage, burnt areas, and dead bodies rotting. "Watch others die" - this will be instances where you turn starving people away, knowing full well that they will probably starve to death soon. It could also be seeing people die from violence outside or maybe it was people you had to kill. "Need to remain alert 24/7" - this is mostly tied to the possibility of theft and violence. If gunfire is often heard nearby or someone has already tried to break in and steal stuff, you will probably go into this mode. Although having a large group to survive with will allow one or two people to remain on watch, so you can rest well. "Chance you'll have to kill someone" - put another way, what are the chances you'll have to get in a gunfight as others attack your position? I just posed it this way, since actually killing somebody would be more detrimental to psychological health, than just engaging in a fight. "Forced to make tough decisions" - this would be deciding whether or not to feed any starving refugees, adopting orphaned children, enforcing severe punishment, having to reconsider if you should bug out, etc. "Ability to walk around and travel" - this is kind of like the antidote to cabin fever. It will keep you in high spirits if you feel safe enough that you can just walk around and get different views and do other things in the surrounding areas. "Encounter blockades" - Authorities and groups of people that band together might set up blockades on roads. These are neutral, so they're not ambushes, but they can cause problems if they hassle you or you have to divert your course along more roads that are already dangerous. I imagine many small towns will set up blockades. Personally, I wouldn't even deal with these. If I see them ahead, I would just take another route if possible. "Encounter ambushes" - at some point, bandits will probably set up ambushes on roads where when someone comes along, they steal from them and might even kill them (or eat them). 1L - If the sailboat is your shelter, then it already exists. On the island, however, you would have to build a shelter. 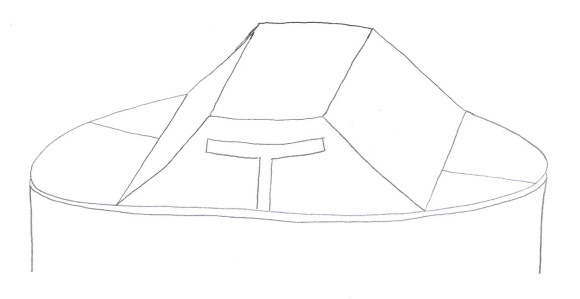 3IJK - You should be able to have tents, tarps, and eventually a permanent shelter. These should be waterproof. 8A - Sometimes city apartments and condos are too small to store a lot of food. 8K - It's nearly impossible to store 9 months worth of food in a backpack, so this gets a very unlikely. However, like I've mentioned above, bugging out on foot can be improved tremendously with garden carts or wagons, which will allow you to bring hundreds of pounds more of supplies. 9IJK - Pre-planting a survival garden could be possible--probably illegal, but maybe no one cares. 10A - I could envision balcony gardening possibilities here. There's not a lot of room, however. You can have plants hanging over to increase space, but that is just inviting problems. 10L - You could do some growing in pots while you're sailing. Once you settle on an island, you can do full blown gardening. 14L - No on the sailboat. Yes on the island. The only wild edible at sea that I can think of is seaweed, but you would most likely have to come close in to the shore. 15L - One major exception that I know of here is if you are bugging out from California and low on food, you can swing by San Miguel Island (or nearly any CA island). There are thousands of sea lions lying on the beaches. They are very fat and very slow. An island you settle on might have wild game as well. 19IJK - You could definitely raise animals there; it will just be difficult to bug out with them in the first place. But if you are able to get animals from someone after you settle, you should be able to do it. 20A - You won't be able to have enough water, unless you can tap into the runoff from the roof. 20BCD - You may be able to harvest rainwater, but it probably won't be enough for drinking, washing, gardening. 20L - Most open ocean sailing vessels will have water makers. If electricity is not available, there are even manual desalinators that can make enough water for multiple people. 21L - We could say that the sea water counts as a personal well. On the island, you might be able to dig one if need be, but it shouldn't be necessary. 22I-L - This setup would depend if you can bug out will all the necessary watering equipment. 23L - You will have this aboard. For the island, even if you didn't bring these items, you should have enough containers and hoses to set up something. 24I-L - This isn't likely, but you can always bury some caches here beforehand. Probably illegal, but could save your life. I recommend water proof containers or bear proof containers if need be. 25A-G - This is not applicable to these columns, since they will already have all their supplies with them at home. However, they were still given full points just to make it fair for the comparison tally. 25K - The use of garden carts would bump this up to somewhat likely. 25L - It all depends on the size of your sailboat, how many people, and how many supplies of course. I envision a 40' catamaran or larger as being ideal. 26I-L - If you anticipate difficult fire starting situations, consider fire pucks. 27A-L - If fuel for cooking is ever an issue, you can use solar ovens and fresnel lenses if it's sunny. 30A-F - There will be a lot good usable building materials around, but it just depends if you can safely retrieve it or not. 30G-L - It will mostly be an abundance of wood. Make sure to have tools like saws, adze, drawknife, froe, etc. 36GH - Gangs will go after easy targets first. They will start in the cities and spread out from there, but they will probably use all their gas before they hit very rural locations. They might hit these locations in time as horse gangs or bicycle gangs. 38DEF - Many preppers like to believe that the good guys will rise to the top and be in power, but it really all comes down to organization and enough food for everyone to eat. It will be hard to organize the good guys and very hard to have enough food for everyone to eat. As a result, it's a possibility that many places that are very friendly now will be ruled by the ones that took the low road after the collapse. 39A-D - Remember, this is a total collapse. Food is no longer being delivered to the stores. The ability to ally with neighbors hinges on the ability to feed everyone. Since most preppers only store enough food for themselves and maybe a few other friends/family, it's just not a possibility to work together with neighbors to defend your neighborhoods. You can ally, but you'll run out of food quickly and everybody will starve. 39E - The reason why this is an outlier of being somewhat likely is because there's a chance that there will be lots of food available. If you act quickly, you can work with neighbors to protect the food, harvest it, and trade it as society is collapsing. (also, see what ranchers and dairy farmers can do when the shtf) However, if it's not harvest time, you'll be out of luck. 39I-L - There shouldn't be any neighbors around to ally with anyways, unless they bug out with you. 40ABC - It depends on how long after the collapse, but if we are talking 1-6 years after, the local power groups will be bad guys and there will be fear of getting out and trading. 41ABC - The new local power groups will be bad guys. You might find a few people to develop relationships with, but most of the survivors will belong to gangs. 42K - This can be improved with garden carts or wagons. 43IJK - Even if you bug out to undeveloped wilderness, you can set up some nice defenses for your survival location. 43L - Miles of open ocean is the best barrier. 45A - This gets a better score than the next two, because you might be elevated and have a good view of nearby areas. 45G - I assume many of these places will be surrounded by trees. 45H - Distant views should be incorporated into the planning of a site like this if more than 10 people plan on surviving here. 45IJK - This category can get a good score, but it depends on terrain and potentially clear-cutting the surrounding area, but I only recommend clear-cutting if you have a large group. In most cases, you won't have a large group. 46G - You'll probably have trees in the way, but you can cut some down. 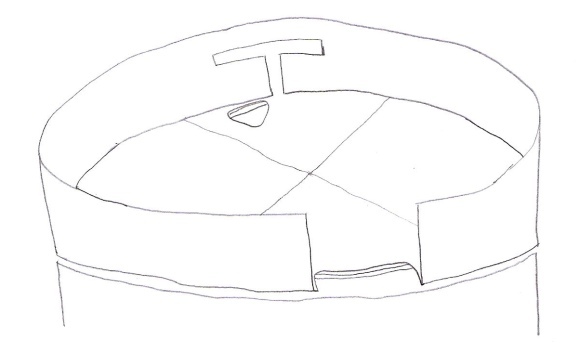 46H - 360 degree views should be incorporated into the planning of a site like this. 46IJK - You should be able to clearcut the area around your location in all directions. 47IJK - You should do your best to camouflage your location and perhaps go semi subterranean. 48A - If you have plants growing on your balcony, or bird traps, or water tanks, etc., they might be seen. 48IJK - Outsiders would be able to see your goods if they are close enough to see your location. 49A - They may see activity on your balcony or notice waste and water runoff leaving your unit. 49IJK - This category can be improved by using rocket stoves or dakota fires, dry wood, or cooking with solar ovens or fresnel lenses. Also, stone paths to the water or underground pipes that lead off from a creek, and living below the snow level helps. 49L - You might think others could see your sails and track you down, but the ocean is too vast and you might be able to outrun them anyways. I suppose once you get to your island and anchor and go ashore, any other sailors that come by could see your ship and then track you down, but that depends on many things, such as the remoteness of the island, visibility, size of your boat, and the shape of the cove. If the island is not uninhabited, it's a possibility of being tracked down. 50A - A city building is the worst place to be when city fires break out--and they will break out. 50G - Clearcutting around your location could improve this box. 50H - This location should have a buffer zone cleared to prevent your dwellings from burning. 50IJK - There are bound to be many forest fires. It may be wise to attempt to locate yourself on the windward side of forests, to reduce your risk of being consumed by a fire. But you'll also want to have a root cellar to duck in or a nearby body of water. 52A - There may be some dog packs, but you will be staying in your apartment, and it's very likely that the million starving individuals around you will catch and eat these dogs. 52BCD - There may be some dog packs that get dangerous, but starving people will begin to hunt and kill any animals they see. 55L - You should be accustomed to your boat, but settling on an island will likely be new. 57L - 2 months in a sailboat can drive you a wee bit crazy. The Island should be great though. 59L - You will need to be more alert at sea, especially if gps and warning systems won't be working. 60A-F - I think in everyone of these locations, starving desperate people will try to steal from you. Gangs may try to steal from you as well. The sheer numbers of starving refugees will almost guarantee plenty of interactions. You may be able to discourage escalation on many of those interactions, but there's a good chance you'll have to fight at some point. 61L - Since you'll be sailing the seas and settling on an uninhabited island, you won't come across other people, which create 90% of the situations that require tough decisions. 62A-E - It will probably be too dangerous to go out. 63A-G - Not applicable, since you would not be bugging out. If you do bug out, it would be late. 63H-L - If traffic lights go out, that could cause traffic jams, even on freeways through cities. I hope they will be able to flash red as long as possible to avoid insurmountable traffic jams. 64A-G - Not applicable, since you would not be bugging out. If you do bug out, it would be late. 64H-L - At this time, most of the violence would be close to the resources, like in the stores. 65A-G - Not applicable, since you would not be bugging out. If you do bug out, it would be late. 65H-L - It will take a couple weeks for criminals to organize and these to develop. 66ABC - You will be lucky if you can still drive out of the city at this point. 66H-L - Not applicable, since you would bug out early. 67E - This is likely, because by this time, many starving people will have migrated to farms, dairies, and ranches to try and find food. You would have to get through these people. 67H-L - Not applicable, since you would bug out early. 68E - Likely, since more people will have migrated to your area in an attempt to find food. They will probably attempt to set up ambushes. Dwight Schrute turns out to be a prepper with a survival bunker and canned food. In this episode, he was eating his stored food, like 8 year old tomatoes, before it went bad. The others in the breakroom were making fun of him, so he gave them this scenario, saying, "Hardy har har. Alright. Picture this: snowy ash drizzles from the sky. A rabid pack of dogs surrounds you as the flame at the end of your stick dies out. There's only one hope left for you--the door to my shelter. You pound. You beg. 'Dwight, please let me in! ', but I ignore your cries and do not let you in...Kevin will be eaten. Pam will be taken slave. 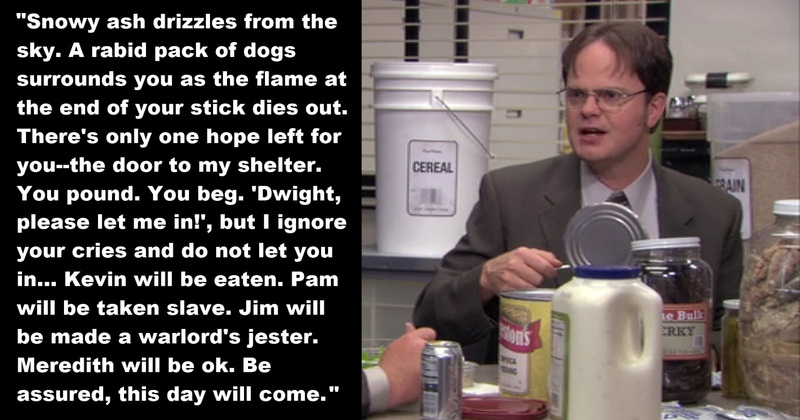 Jim will be made a warlord's jester. Meredith will be ok. Be assured, this day will come. It's just a matter of time." 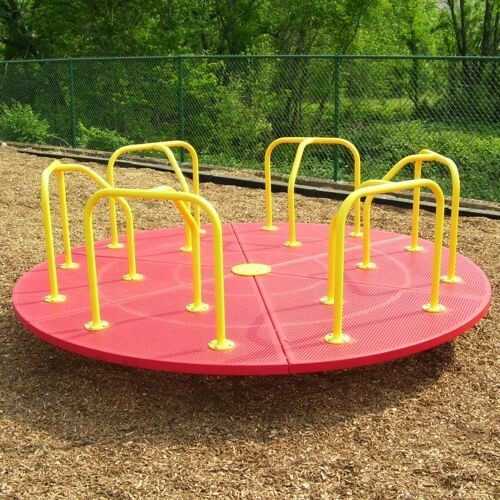 Here's a novel idea - take a child's merry-go-round and turn it into a rotating manned turret. If society collapses and you need to defend your position, this might be a great idea. 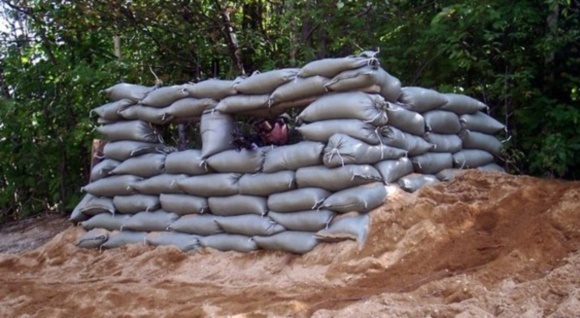 High tech, expensive weapons and defenses are often the best, but preppers know that in a post-collapse scenario, low tech, reliable weapons and defenses are often the better choice. Then cut off most or all of the railings. 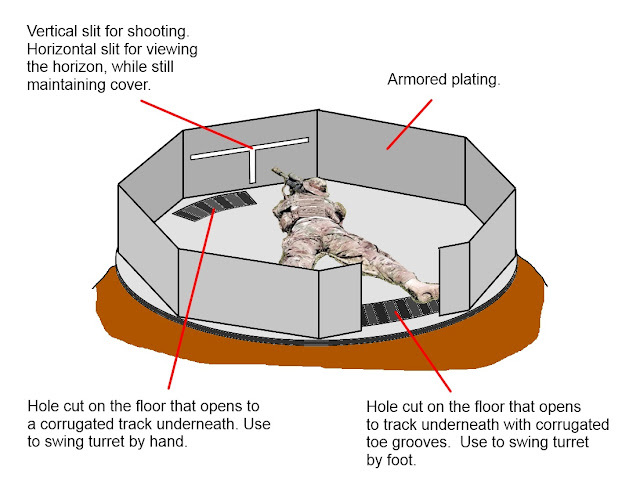 (They may act as support if you choose to add a roof) You may need to lay down armored plating on the bottom of it, depending on if you expect projectiles to come up at you. 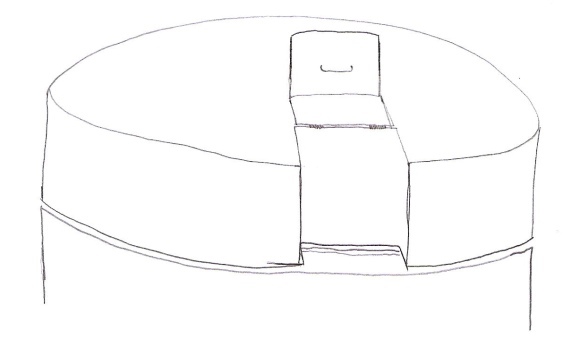 In these illustrations, I have the merry go round elevated on a platform, but you could have it at ground level. 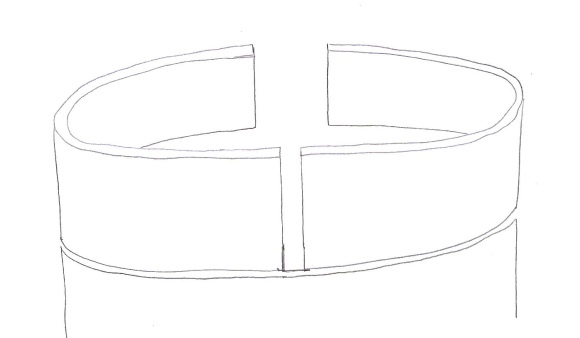 You'll need a way to spin the turret, so I figure the best way to do that is to cut some holes in the bottom. One hole would be toward the front and you could use your hand to spin. The other would be toward the rear, so you could use your feet to turn it. 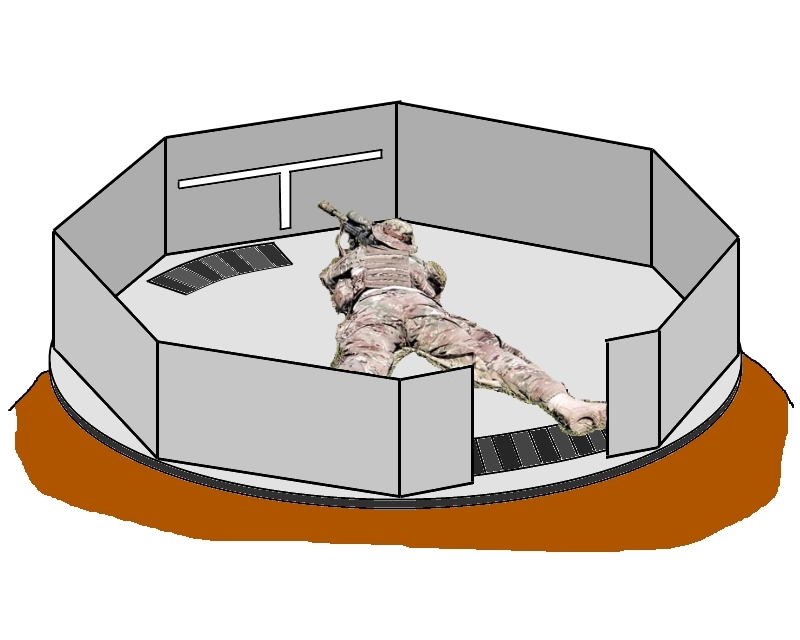 The shooter could remain in a prone position the whole time, while he spins the turret to the desired position. You wouldn't necessarily have to have anything special below. 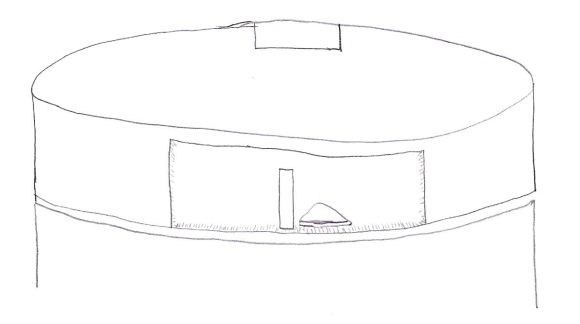 A flat surface with grip would work, but it would be better to have something more substantial, since it will require a bit of force to get the thing moving. 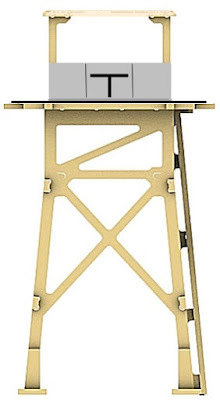 So, I would recommend either a railing all the way around for hands to grip and turn, or corrugated grooves deep enough for toes to dig in and turn the turret. 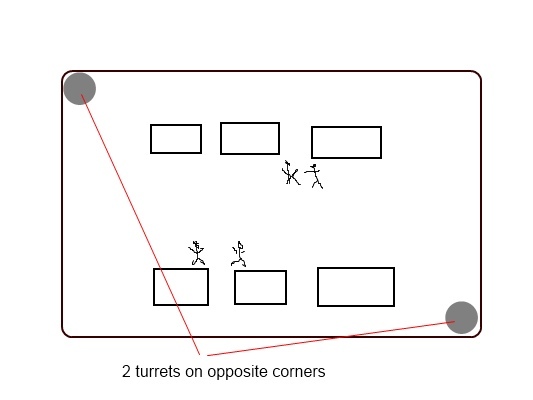 If the thing ends up being too heavy and too difficult for the shooter to rotate easily, you could have two people working as a team. Of course, it also wouldn't be too difficult to motorize the thing and rotate it with a switch. 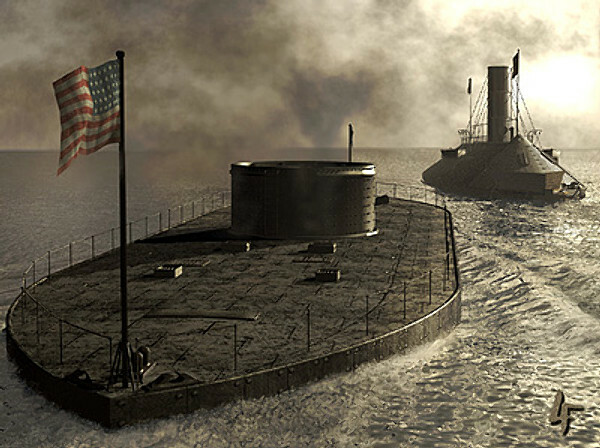 With a design like that, you'll have something that looks like the turret from the USS Monitor from the Civil War (just a lot smaller, and a gun instead of a couple canons). Another option would be to put bulletproof glass on the front end. If you can afford it, this will give much better visibility. 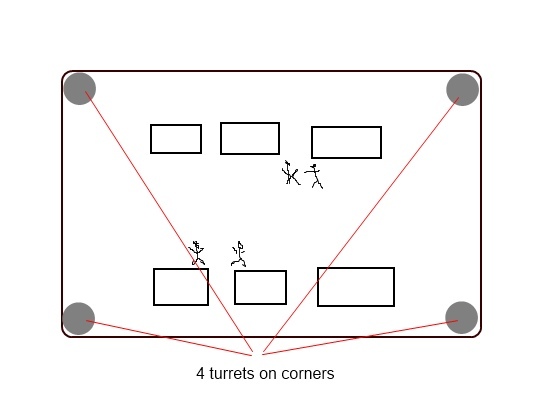 With the turrets in positions at the outside of your camp/compound/dwelling, you have to decide if you want the turrets be able to face inward. There are pros and cons for either choice. I'm leaning toward not allowing them to face inward. Rigging that should be a simple welding operation. If there is an elevated position in your survival location, such as a sundeck, a 2 story building, or a tower, you can have one central turret. It's a perfect sniper perch where he can remain protected and shoot in all 360 degrees. Who will the turrets be best suited for? I have no military experience or tactical training, but I'm thinking it will be best for snipers. It gives them the perfect opportunity to remain in the prone position and rotate for accurate aiming in any direction, all while remaining protected. I think it would also be good for machine gunners if you have any, since their protection is vital. Another option might be if you're in a worst case scenario; you're under attack and you are low on men and you need women and teenagers to take up arms. You might want to put your teenager in the turret, because they'll be better protected, while you take up another position. Should the turret be camouflaged? If you are trying to keep your entire survival location hidden, then by all means, camouflage it. If you are not trying to keep your location hidden, you may or may not want to camouflage it. If it is camouflaged, it may prevent attackers from coming up with a plan to deal with the turrets. If it is not camouflaged, it may deter attackers altogether, so it's your choice. However, once fighting begins, I'm thinking it is best for it to not be camouflaged. 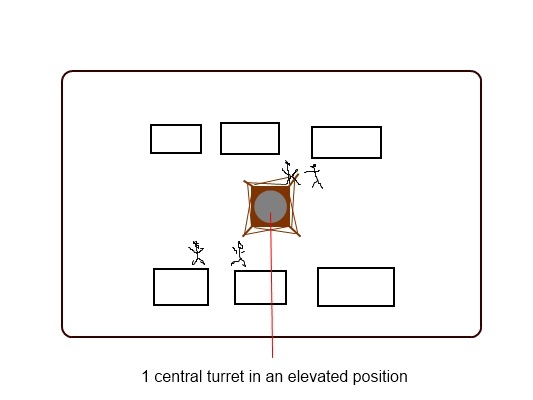 If the attackers see a huge turret swing around, they will be fearful. They will think you are more capable than they expected you to be--than they expected anyone to be in a post-collapse world. Do you have any suggestions, thoughts for improvement, or critiques of this idea? I would love for the military guys to chime in.